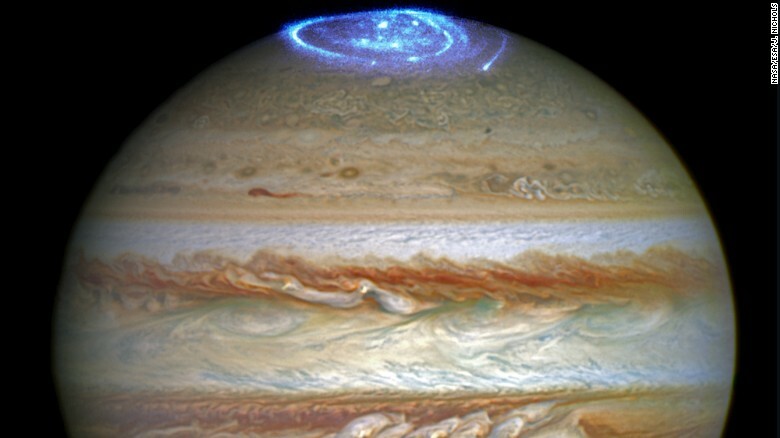 Image of auroras on Jupiter’s north pole, one of the many phenomena Juno will research. Image credit: NASA’s Hubble Space Telescope. This Independence Day not only marks the formation of the United States of America, but also the day NASA’s Juno spacecraft will reach Jupiter. 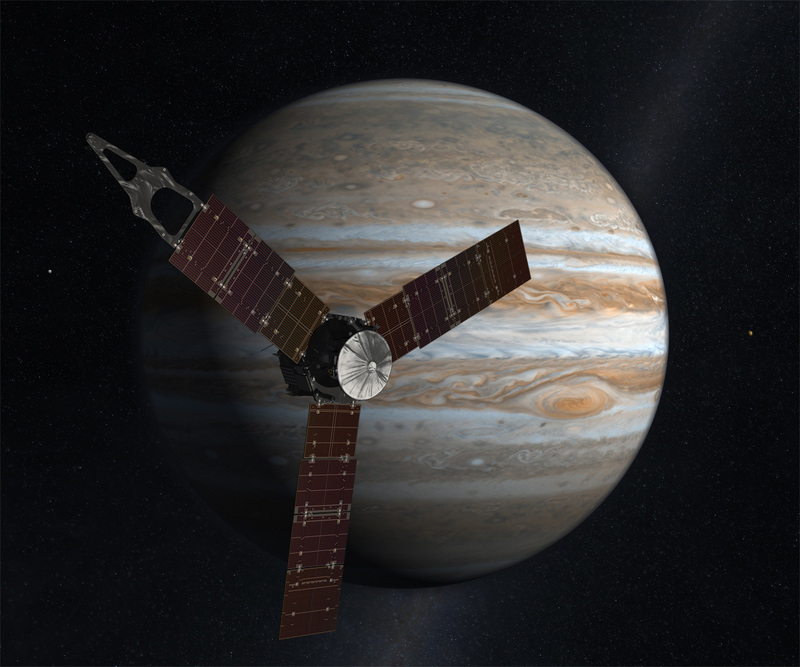 After nearly five years and 1,740 million miles (20 meters), Juno will be pulled into orbit around the gas giant, beginning its year and a half mission to study the planet. NASA will preform a 35-minute-long maneuver to slow down the probe, one equivalent to slamming the brakes on a basketball court sized truck without friction to help stop it. The process is scheduled to begin at 11:19 p.m. ET (8:18 p.m. PT) and will slow down Juno by approximately 1,212 miles per hour (542 meters per second). Artistic portrayal of Juno and Jupiter. Image credit: NASA. Essentially to understand Jupiter is to understand the solar system. The major goal behind Juno’s mission is to gather data as to how gas giant planets form and how Jupiter influences the rest of the solar system. To accomplish this, Juno’s many objectives include: to discover the origin and evolution of Jupiter, determine the existence of a solid planetary core, collect atmospheric data- specifically temperature readings, movement pattern of clouds, and concentrations of water and ammonia-, and observe the planet’s auroras. For a comprehensive analysis, check out the mission website here. 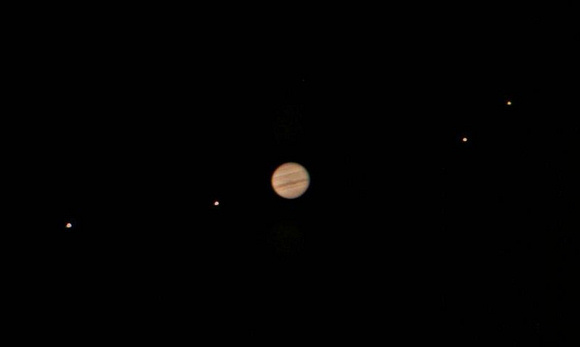 Jupiter and its four largest moons seen from Earth. Image credit: Jan Sandberg. The fifth and largest planet in our solar system, Jupiter most closely resembles our Sun out the rest of the planets. To decipher why this is, it is critical to examine the theory as to how the solar system formed. Stars are born in giant and gaseous galactic nurseries called nebulae (singular: nebula). It is believed our Sun was formed just like most other stars, by the collapse of a giant gas and dust cloud within a nebula. But our Sun did not capture all of the materials during its formation. The leftover matter presumably transformed into the planets. It is believed Jupiter captured most of the forgotten helium and hydrogen, some of the earliest chemicals in the history of the solar system. We have no way of knowing for certain whether this stellar storyline is true since humans- or Earth for that matter- did not exist. These conclusions are only plausibly drawn based on observed behaviors within our galaxy. By sending Juno to Jupiter, scientists have the opportunity to study the planet’s immense gas clouds, which are not only beautiful to observe through a telescope, but also hold the answers to how Jupiter and the rest of the early solar system formed. In Roman and Greek mythology, the god Jupiter would cover himself in a veil of clouds to hide his mischief. Only his wife, the goddess Juno, could see through the clouds and unveil Jupiter’s true nature. After circling Jupiter 37 times and exploring 2,600 miles deep into the planet’s atmosphere, Juno will terminate its mission February 2018 by falling down to Jupiter’s core. Keep looking up, and happy Fourth of July! Astronomy, discovery, Fourth of July, Juno, Jupiter, NASA, nebula, science, Space. Bookmark.